Back last year, I wrote a column on how Greensboro and Guildford County were the most written-about locations in North Carolina during the war. With five books on the subject, I still hold to that. But New Bern, I believe, is the most-illustrated part of North Carolina during the war. Harper's Weekly, April 19, 1862. Following a battle just south of the town, Federal forces captured New Bern in March 1862. They held it for the remainder of the war, and often used it as a staging area for raids toward the east. 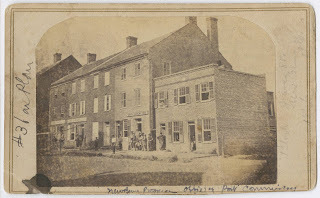 Even though parts of New Bern were burned during the Confederate retreat, large portions of the colonial capital survived. New Bern, Craven Street, ca. 1863 in the North Carolina County Photographic Collection #P0001, North Carolina Collection Photographic Archives, The Wilson Library, University of North Carolina at Chapel Hill. Masonic Hall, New Bern, ca. 1863 in the North Carolina County Photographic Collection #P0001, North Carolina Collection Photographic Archives, The Wilson Library, University of North Carolina at Chapel Hill. Middle Street, New Bern, ca. 1863 in the North Carolina County Photographic Collection #P0001, North Carolina Collection Photographic Archives, The Wilson Library, University of North Carolina at Chapel Hill. Harper's Weekly, July 19, 1862. There were wood-cut illustrations of the battle of New Bern, along with scenes of the city itself, over the next few years in various newspapers from the North. And, there were photographs as well. 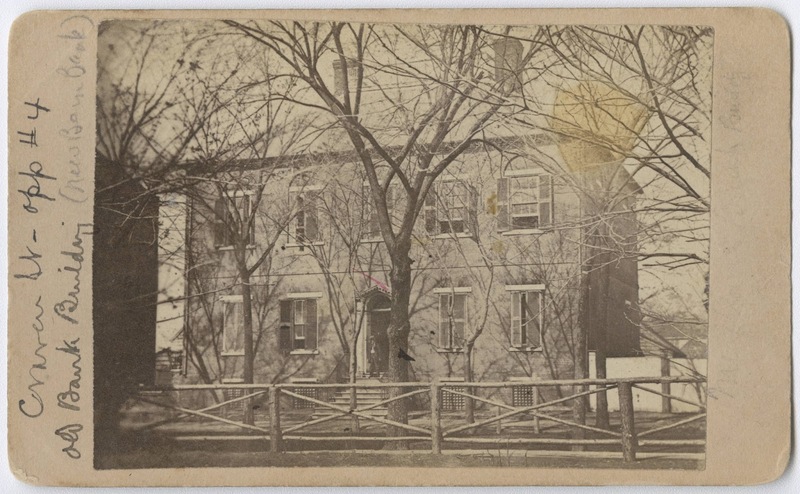 Photographer E. J. Smith visited the two in 1863. The North Carolina Collection Photographic Archives at UNC-Chapel Hill has 27 carte-de-visite prints attributed to Smith taken in New Bern. These, coupled with the newspaper illustrations, make New Bern the most illustrated place during the 1860s. At the recent Emerging Civil War symposium, I was chatting with Gettysburg Guide Matt Atkinson, and he told me of an account of generals squabbling over who should lead the Light Division after Pender's wounding on day 2 of Gettysburg. So I tracked down the source: Writing and Fighting the Confederate War: The Letters of Peter Wellington Alexander, Confederate War Correspondent. Alexander was born in Georgia, a graduate of the University of Georgia, a lawyer and newspaper reporter. He was the war correspondent for the Savannah Republican. The book was edited by William B. Styple and contains 200 letters that Alexander wrote for various newspapers. Lane would write that he observed Pender riding to his right late in the day on July 2. The Light division consisted of Lane's North Carolina brigade, Brig. Gen. Edward L. Thomas's Georgia brigade, McGowan's brigade, under Col. Abner M. Perrin, and Scales's brigade, under Brig. Gen. Alfred M. Scales. At the time, right to command was based upon seniority of rank, or, who had held that rank the longest. Lane's promotion to brigadier general dated to November 1, 1862. Alfred Scale's promotion was dated June 13, 1863. He was also wounded on day 1 and replaced by Col. William J. Lowrance. Now to Edward Thomas, whose promotion to brigadier general also dated to November 1, 1862. So, if there is an argument, it is between Lane and Thomas. If I understand the ranking question, next, the generals would have looked at who was at the previous grade the earliest. 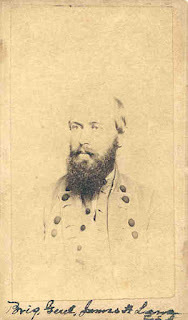 Thomas was promoted colonel of the 35th Georgia Infantry on October 15, 1861. It was his first command of the war. Lane served as major and then lieutenant colonel of the 1st North Carolina volunteers, and was promoted to colonel of the 28th North Carolina Troops on September 15, 1861. Lane was clearly senior to Thomas. There is a lot of discussion about the Light Division not coming to support of the troops doing battle on the evening of July 2. Was that Lane's fault? What we really lack is a timeline. When was Pender wounded? When did Lane learn that he was in command? Just how aware was he of where the other brigades were posted, and of the plan for the day? There are two things that throw the whole debate over seniority into question. Lane writes in his official report of the battle of Gettysburg that "Capt. Norwood, of Genl. Thomas's Staff, that Genl. Pender had been wounded & that I must take command of the division..." If Lane and Thomas had been arguing over who had seniority, then there was no need for a staff officer to inform Lane of who was in command. This past weekend, I had the chance to attend the Emerging Civil War conference in Spotsylvania, Virginia. The theme for the event was "Great Attacks of the Civil War," and that got me to thinking: what were the great attacks in the Civil War in North Carolina? Now it would be easy to put the assault of Hardee's and Stewart's men at Bentonville, or Ames' Division at Fort Fisher. But what came to mind are two much smaller affairs, that had greater repercussions. The first of my two "Great Attacks" takes place in 1861. Forts Clark and Hatteras were constructed either side of Hatteras Inlet not long after North Carolina left the Union. They were meant to keep the Federals out of the Pamlico Sound. On August 28, 1861, Federal naval ships bombarded Fort Clark. Unable to return fire due to the range, Confederate forces fled to Fort Hatteras. Fort Clark was captured, and the Union naval vessels turned their attention toward Fort Hatteras. After several hours of intense bombardment, the fort surrendered, and 700 Confederates became prisoners of war. The loss of these two installations opened the Pamlico Sound to the Union navy and army. Roanoke Island fell in February 1862, the battle of New Bern was fought in March 1862, and Fort Macon fell on April 26, 1862. Later, Federal soldiers set out on raids against Kinston, and battles were fought at Wyse's Fork (this is a short list), all because these two small forts fell in August 1861. My second pick is on the other end of the state. In June 1864, then Capt. 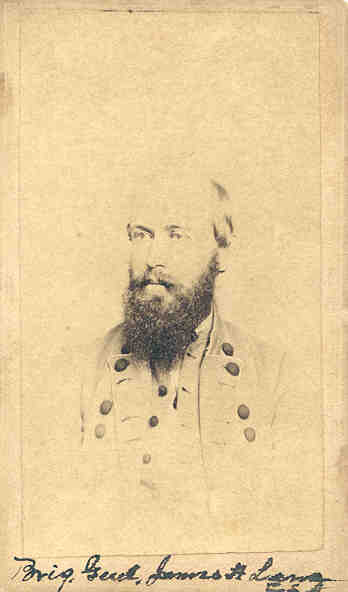 George W. Kirk led a small band of men, about 120, mostly from the 2nd North Carolina Mounted Infantry (US), on a raid against Camp Vance just east of Morganton in Burke County. The capture of the camp and the skirmishes (maybe three or four), fought between Kirk and various home guard elements as the Federals attempted to flee back to east Tennessee, are minor in the grand pantheon of Civil War battles. However, Kirk's Raid showed many that with the Confederate abandonment of east Tennessee, the back door to the heart of the Confederacy was wide open. Federal raiding parties could move through the area, and even into upstate South Carolina and the mountains of north Georgia. More importantly, family began to write their loved ones in the army in earnest, imploring them to come home and offer some level of protection against the murdering parties stripping the countryside blind. 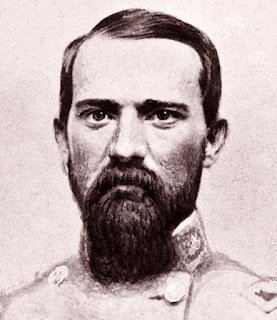 Kirk's Raid kicked into high gear a war-within-a war in western North Carolina, and caused further desertions among the Tar Heel Confederate soldiers in the Army of Northern Virginia and the Army of Tennessee. So there you have it: the loss of Forts Clark and Hatteras and Kirk's Raid, my two "Great attacks" in North Carolina in terms of effectiveness. What would your great attacks be? I really don't like unanswered questions. However, delving into the murky past provides me with scores, nay, hundreds of unanswered questions. Writing the book on the Branch-Lane brigade is no exception. I would still like to know what flag was issued to the brigade on the eve of the Seven Days campaign. I'd still like to know just how far to the left the 33rd NC was at the battle of Second Manassas. Just why did Lane and some of his lieutenants go into the fight on the afternoon of May 12, 1864, unarmed? Maybe in time, I will find these answers. Nevertheless, this project is just about finished for me. 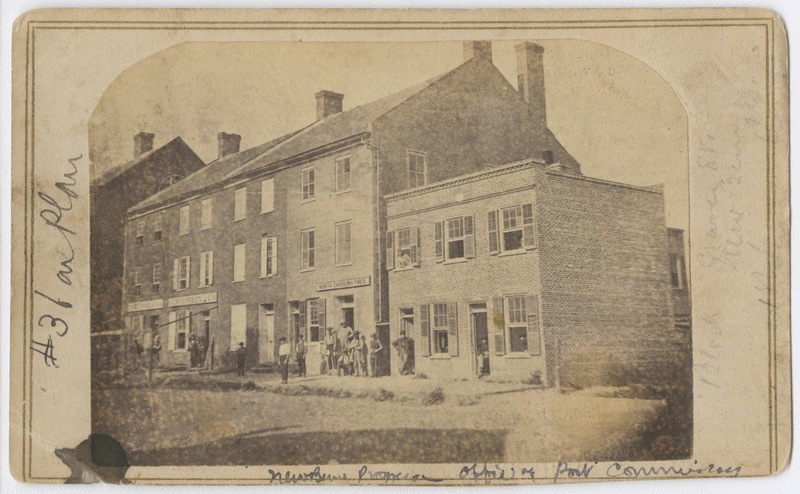 Of course, there are several instances where I have made some pretty good finds - like information on the role of the brigade on day two at Gettysburg, and Lane's personal observation about Appomattox. Some really good stuff you will not find in other places. There is, however, one piece I am still seeking: James H. Lane's pardon. 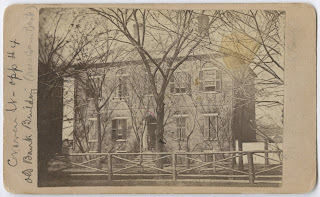 Lane wrote his letter on July 10, 1865, from Matthews County, Virginia, the home of his parents. The letter is short, just one page. "I respectfully make application for pardon under your amnesty proclamation of May 29, 1863, and ask to be restored to all the rights of a citizen of the United States. I entered the Confederate service from the State of North Carolina, and served as a Brigadier General in the Provisional Army of the Confederate States from the 1st of November 1862 to the surrender of the Army of Northern Virginia. I am without property and without money. My address is Norfolk, Va Care of Mr. William R. Hudgins." There is just one other piece - on July 11, 1865, Lane went before the provost marshal and took the Oath of Allegiance. Missing is the date Lane was granted his pardon. 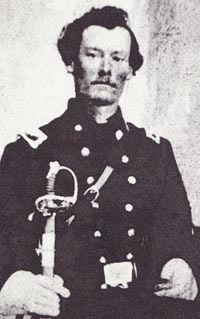 Lane, post-war, with cloth covering the buttons on his Confederate coat. In trying to find Lane's pardon, I came across an article entitled "The Soldier's Burden: A Study of North Carolina Confederate Officer Request for Amnesty." According to the article, US President Andrew Johnson issued a Proclamation of Amnesty and Reconstruction on May 29, 1865. Former Confederate soldiers were all pardoned, unless they fell into one of fourteen classes. Lane, serving as a brigadier general, was excluded and had to write the president, through the governor, asking to be pardoned. Lane should have sent his letter to North Carolina governor W. W. Holden, although nothing in the file indicates this. There were thousands of applications that flooded into Washington City. Johnson was slow on pardoning Confederate officers. 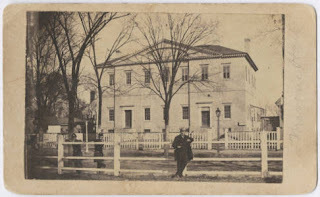 While there does not appear to be evidence that Lane ever did, other former Confederate officers frequently wrote friends in Washington City, inquiring about their application and asking for intervention. President Johnson, in an attempt to speed up Reconstruction, pardoned all but men who fell into three classes on September 7, 1867. Men who had served as Confederate brigadier generals were still in the unpardoned class. On July 4, 1868, Johnson granted amnesty to all former Confederates, except a group of 300, who were under indictment in United States courts under the charge of treason or other felonies. Johnson issued his final mass pardon on December 25, 1868. As far as I can tell, James H. Lane should have been pardoned on July 4, 1868. I've not found where he was under indictment, although he was once arrested and imprisoned at Fortress Monroe for incendiary speech. He was later released when it was discovered it was another man named Lane making the remarks.